When I first started writing about climate change and the environment back in the 1980s, the atmospheric CO2 levels stood at approximately 340 parts per million. We are now firmly past 400. We are so far into uncharted territory, that all predictions are at best, educated guesses. However, very few of these guesses are encouraging. Anyway, I like this fictional account below. Because it points out an obvious fact. Not only are we going to have to spend big bucks replacing the fire-based infrastructure, we must do something to return the CO2 levels to let's say, 310, or even 275. What we need is a synthetic version of photosynthesis. And we need it immediately because say we did invent a process that could capture atmospheric CO2 and turn it into O2 plus a very pure carbon, we are going have to put up probably 250,000 installations to start moving the needle down. Even Elon Musk wouldn't promise this in five years. We are talking a Manhattan Project-size effort x 50. Compared to the effort to make inexpensive solar cells, the synthetic photosynthesis business is still pretty primitive. But at least there are folks who are producing hardware who also have a good idea how important this is. Climeworks carbon capture device will take the gas from the air and sell it or store it in the ground. Now we just need a few hundred thousand more�as quickly as possible. Sitting on top of a waste incineration facility near Zurich, a new carbon capture plant is now sucking CO2 out of the air to sell to its first customer. The plant, which opened on May 31, is the first commercial enterprise of its kind. By midcentury, the startup behind it�Climeworks�believes we will need hundreds of thousands more. To have a chance of keeping the global temperature from rising more than two degrees Celsius, the limit set by the Paris agreement, it�s likely that shifting to a low-carbon economy won�t be enough.�If we say that by the middle of the century we want to do 10 billion tons per year, that�s probably something where we need to start today.� [Photo: Julia Dunlop]�We really only have less than 20 years left at current emission rates to have a good chance of limiting emissions to less than 2�C,� says Chris Field, director of the Stanford Woods Institute for the Environment and coauthor of a recent paper discussing carbon removal. �So it�s a big challenge to do it simply by decreasing emissions from energy, transportation, and agriculture.� Removing carbon�whether through planting more forests or more advanced technology like direct carbon capture�will probably also be necessary to reach the goal. Carbon dioxide can be removed from ambient air through chemical processes, sequestered, and stored. Traditional modes of carbon capture such as precombustion and postcombustion CO2 capture from large point sources can help slow the rate of increase of the atmospheric CO2 concentration, but only the direct removal of CO2 from the air, or �direct air capture� (DAC), can actually reduce the global atmospheric CO2concentration if combined with long-term storage of CO2. A few engineering proposals have been made for removing CO2 from the atmosphere, but work in this area is still in its infancy. Among the main technologies proposed, three of them stand out: Causticization with alkali and alkali-earth hydroxides, carbonation, and organic-inorganic hybrid sorbents consisting of amines supported in porous adsorbents. A 2016 article reviews the research in these various areas. The finding would explain early oxygen in Earth's atmosphere�and it's some fodder for sci-fi space breathing apparatuses. Photosynthesis sure is a miracle, isn't it? It allows plants, bacteria, and algae to take carbon dioxide and, with the help of a little sunlight, turn it into the oxygen we all breathe. 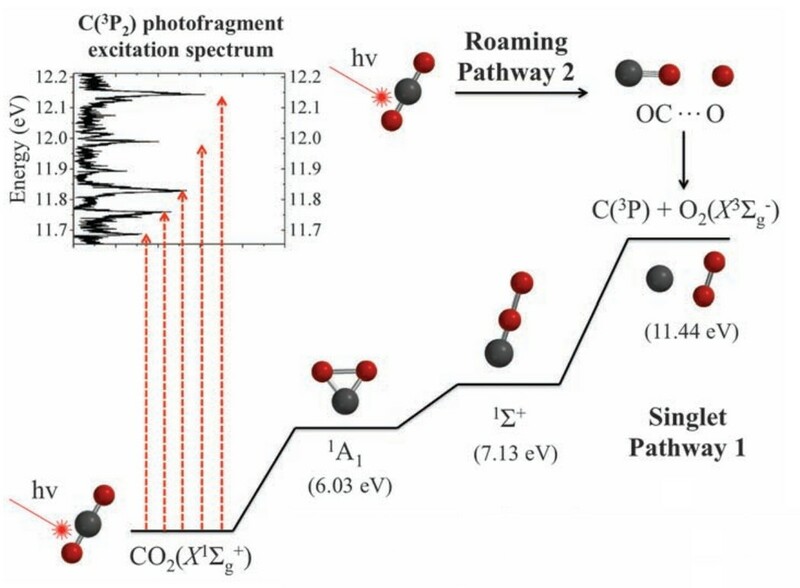 But now scientists have taken photosynthesis out of the equation and have managed to make oxygen (O2) by zapping carbon dioxide (CO2) with a laser. In chemistry, the general wisdom is that molecules, if we were to anthropomorphize them, are lazy. Carbon dioxide, when its bonds are broken into its component parts, takes the "minimum energy path," meaning it will break into one oxygen atom and a carbon monoxide molecule (CO), because, as chemists Arthur Suits and David Parker explain in a new analysis in Science, CO "possesses a much more stable diatomic bond than O2." Carbon is double bonded to the oxygen atoms, and it's way easier, chemically speaking, to simply lop off one of those bonds and create a CO molecule and an oxygen atom. So, the conventional wisdom has been that under almost all circumstances, it'd be impossible to take carbon dioxide�say, from a human's exhalation, for instance�and turn it back into gaseous oxygen, which would require two oxygen atoms. But then, researchers at the University of California, Davis decided to try doing just that by exciting carbon dioxide using what's known as a "high energy vacuum ultraviolet laser." It turns out that, in a highly excited (and still anthropomorphized) state, carbon dioxide and other molecules have a bit more energy to skip that minimum energy path and, like any agitated person/molecule, feel like "roaming," which is a chemical phenomenon in which chemical bonds will break in other ways. The UC Davis researchers found that the chemical bonds did indeed break in other ways, and were able to turn carbon dioxide back into oxygen and a single carbon atom (they also describe the discovery in Science).